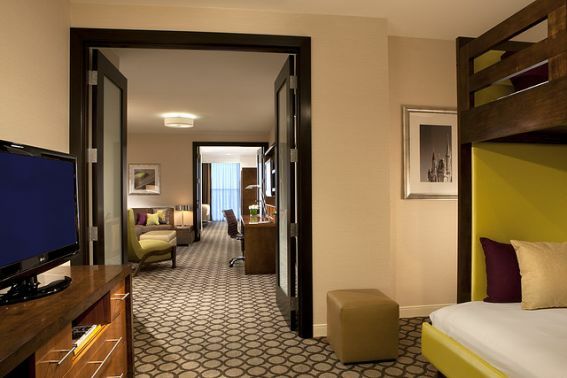 Deciding which hotel to stay at while enjoying your Disneyland vacation can be a daunting task. Should you stay on property or off? How important is being within walking distance to the parks? What about shuttle service or early morning perks like free breakfast or even entering the park before it opens to regular guests? 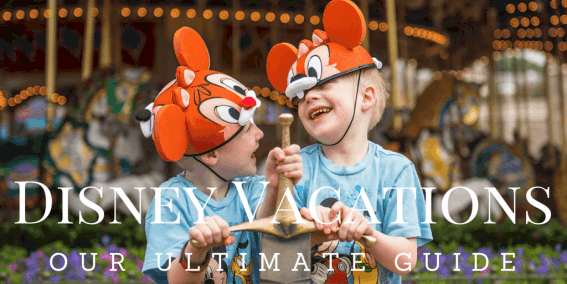 We poured through Trekaroo reviews, all written by real parents, and combined it with our own experience and expertise to create the ultimate guide to the hotels near Disneyland. All Disneyland Resort guests get to take advantage of early admission with Extra Magic Hour – entrance to the park one hour before the general public. The prime location of these three hotels makes for easy access to both parks, with a separate entrance to California Adventure through The Grand Californian. Character breakfasts take place in each hotel and kids can request a character wake-up phone call to start the morning right. Be sure to take advantage of Package Express and send souvenir purchases back to your room from inside the park. This magical hotel delights families with headboards that play “A Dream is a Wish Your Heart Makes,” character greetings in the lobby, and many interactive experiences such as learning to draw Mickey Mouse. The Disneyland Hotel is located in a prime location with easy access to the Monorail Station in Downtown Disney, taking families directly to Disneyland’s Tommorowland. Be sure to reserve at least one afternoon of your vacation for splashing down the Monorail slide and swimming in the E-Ticket Pool. 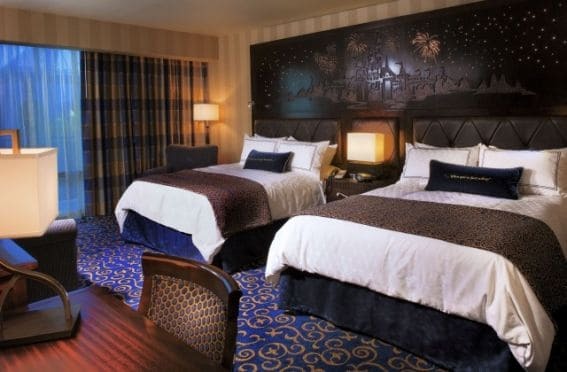 Book a room at the Disneyland Hotel. 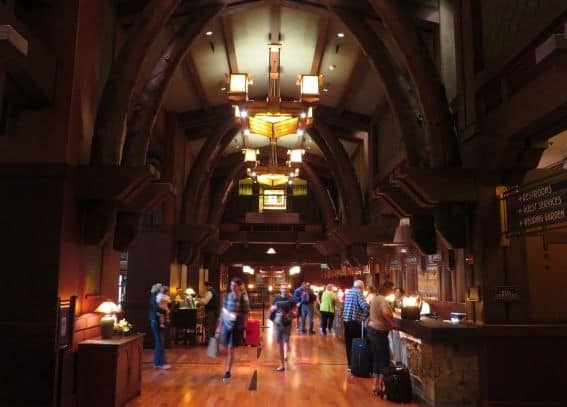 A stay at the Grand Californian Hotel & Spa is a must if you can afford the splurge. The craftsman style architecture instantly whisks you away from Orange County and drops you into a luxurious national park lodge with high ceilings, wood beams, and a roaring warm fire filling the lobby. Standard rooms are well equipped and comfortable, although not overly large. Character breakfasts and fine dining options are available; put the kids in kid’s club and enjoy a meal at Napa Rose- you won’t regret it. This Disney property is a block away from the main park and the lower price point allow guests to save money while maintaining all that is magical about a Disneyland Resort. The rooms are spotless while housing everything that is kid friendly! Character dining, roof top water parks, and early entry to Disney’s Magical Mornings are just a few reasons why your family will love Paradise Pier. This relaxed and contemporary property is a great place to make your Disney memories! Book a room at Paradise Pier Hotel at the lowest rates! 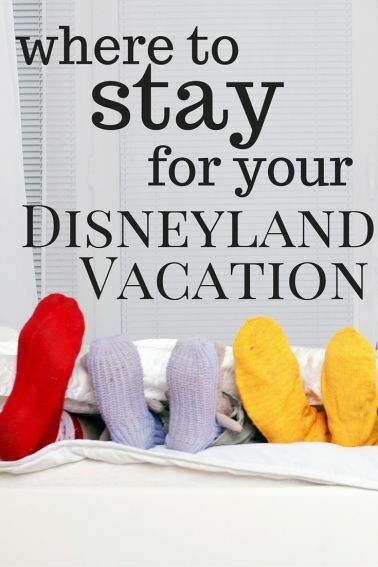 Read Trekaroo’s Why Stay at a Disneyland Resort Hotel. 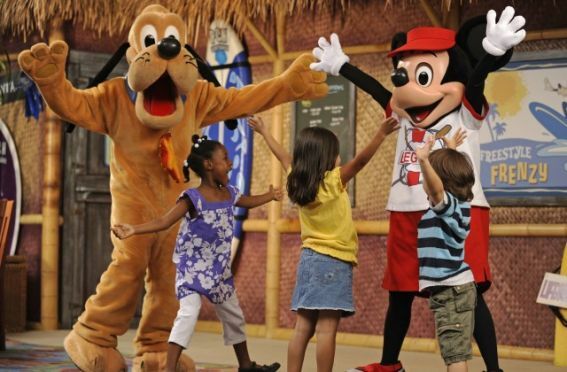 Staying at a Disneyland hotel is not the only way to create a magical Disney family vacation. Anaheim, CA is a family-friendly destination in the midst of a revitalization. Great accommodations can be found all over the city and most area hotels offer pools, dining experiences, and transportation options to the resort. Walt Disney Travel uses the term “Good Neighbor” to indicate a property that provides quality accommodations and is located near the Disneyland Resort. The new Hyatt House at Anaheim, located on the corner of Harbor & Katella, is a fabulous option for families seeking modern, apartment-style accommodations during their Disney trip with the added perks & benefits of a hotel included. The full kitchen allows families to dine in-room on a budget (or easily pack lunches, stash leftovers, etc…) while the complimentary buffet-style breakfast gets your family ready for a day’s worth of adventure with full stomachs. Families will also feel at home with a variety of game rentals to play in room, sprawling pool deck with BBQs available for use, onsite dining and bar, fireworks views, and laundry machines that allow you to pack light. Kid’s Suites include bunk beds and separate TV area. 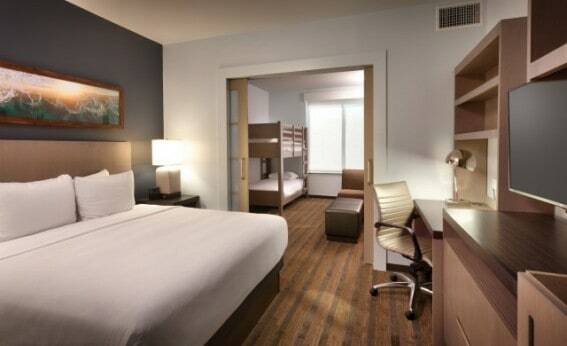 Check out details & reviews of Hyatt House Anaheim. This Disneyland-area Hyatt property comes highly recommended from our Trekaroo community members because it offers an incredible value and comfortable accommodations for families of all sizes. Their 700 sq. ft. VIP Family Suite includes a master bedroom, bunk beds, two full-sized bathrooms, three 42 inch LCD TVs, and a parlor room with a pull out sleeper sofa, beginning at just $252 a night! 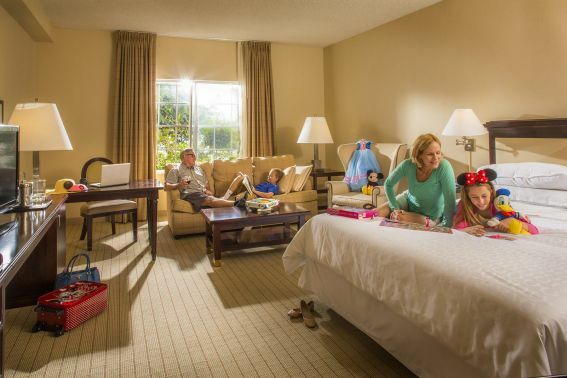 The Anaheim HoJo is situated close enough to Disneyland for guests to easily walk there with children of all ages–even on tired legs after a full day at the park! The property includes a pirate ship-themed water playground, a great alternative to mid-day madness inside the Disney parks. The newest name in Anaheim is the renovated Anaheim Majestic Garden Hotel (formerly “Sheraton Anaheim Hotel”). The property, designed like a grand European castle, features a beautiful story of a princess who saved her kingdom that is featured on the walls of the halls, allowing children can navigate the hotel to follow the tale. The kids will love the Castle Package; select rooms feature castle bunk beds, dining with the resident princess, and free WiFi! The cherry on top of this sundae is the Anaheim Majestic Garden Hotel is grandfathered into the rare free onsite Disneyland Main Gate drop off. 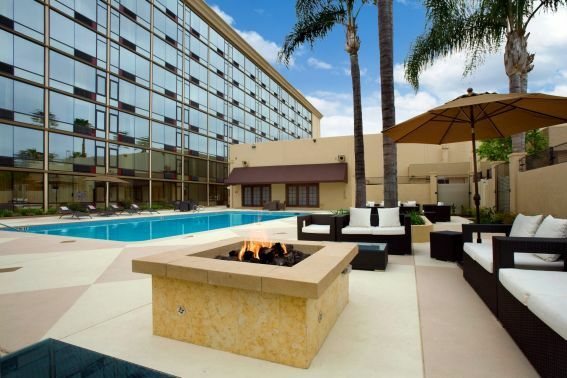 An 18-minute walk from Disneyland or a 3-minute ride on a shuttle (for an additional fee), the Hilton Anaheim is not only close enough to get back and forth quickly, it’s also convenient enough for a mid-day pool break from the Southern California heat. Kids love the play area at this pool which features a collection of climbing choices, a slide, and a row of noise-making activities with water rushing out of every angle and occasionally being poured over the top. Parents love the poolside service as well as the opportunity to rest tired, aching feet before returning for more fun at the Happiest Place on Earth! The Anabella offers a great location and premium family accommodations. Families should request placement upstairs, these rooms offer additional sleeping space for your little ones. Kids will love their private space including their own day bed and a flat screen TV. The property is located at the end of the Disneyland property; perfectly centered between the Main Gate entrance and the Downtown Disney entrance. Take advantage of the beautifully lit path through Downtown Disney to end your night. This property offers great deals and a premium location to delight the entire family. Enjoy a hot breakfast, free WiFi, and onsite parking with the Disneyland Package. The hotel is a 15-minute walk to the main gate and located just across the street from the Gardenwalk, which hosts great shopping and family-friendly food options. 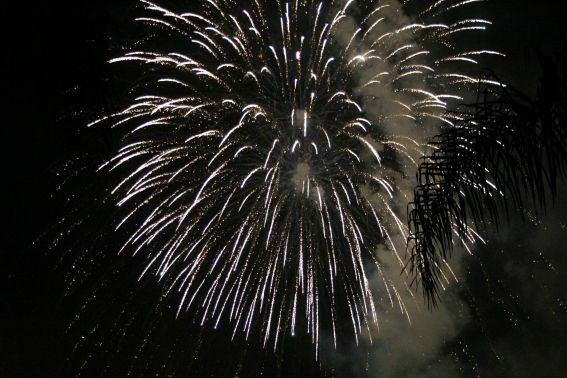 Your family will be delighted by the firework views; grab a drink and head to the north side of the building for a great show! Kids can enjoy s’mores by the fire on the weekends. If you are looking for a great escape and a Good Neighbor location for your trip to Disneyland, the Anaheim Marriott Hotel is a great option. 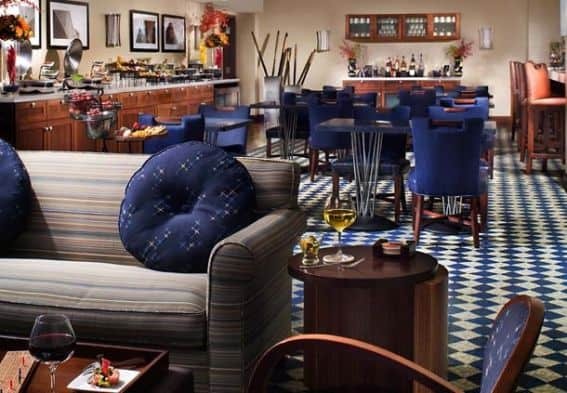 The property offers premium amenities: onsite gourmet dining, premier pool lounge, and concierge service. 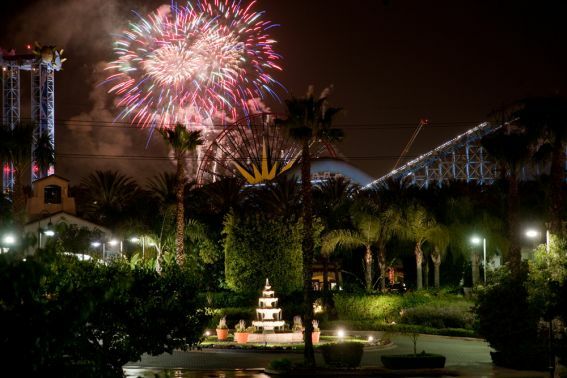 The location is great- the Anaheim Marriott is located directly across from a main Disneyland parking lot. Guests can walk the two blocks to the lot and hop on the bus! Upgrading to the concierge level will get your family WiFi, breakfast, and an assortment of treats throughout your stay. Want more lodging suggestions near Disneyland? Check out Pit Stops for Kids’ review of the Courtyard by Marriott. 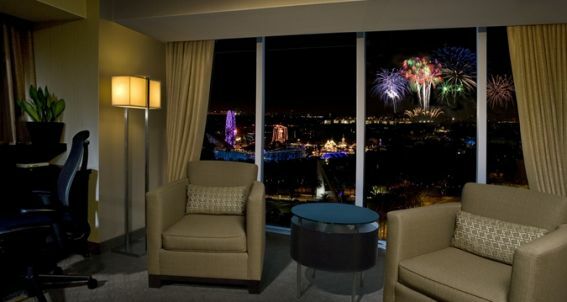 Want a great view of the fireworks right from your room? The Hotel Menage is your place! Enjoy the close up performance from the hotel pool deck; most rooms overlook the back of “It’s a Small World” and offer a picture perfect view! The property is a 12-minute walk from Disneyland and across the street from quick food stops like Starbucks and Taco Bell. Located just down the street from the Disneyland Resort, Great Wolf Lodge Southern California is truly a destination unto itself. 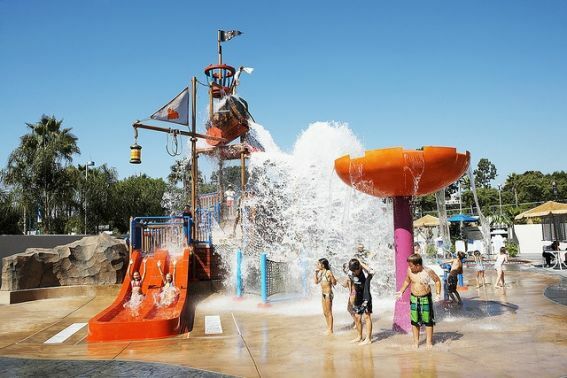 This resort features the first indoor water park in California as well as several other attractions such as minigolf, an arcade, a kids spa, and MagiQuest, an addictive live-action role playing game. Many rooms include “Wolf Dens” or “KidCabins” which feature special little rooms for children complete with bunk beds and their own private flat-screen TVs. Great Wolf Lodge Southern California has partnered with Disneyland to put together discount packages which include the same Magic Morning access that folks who stay at Disneyland Resort properties receive. 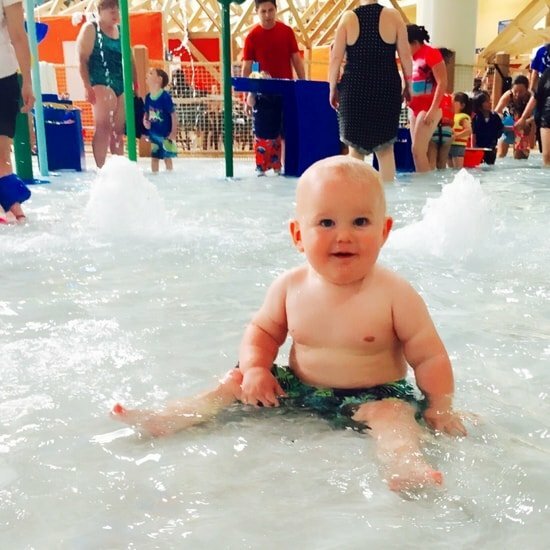 Read Trekaroo’s 15 Things You Need to Know Before Booking Your Trip to Great Wolf Lodge. Explore our ultimate guides to Disneyland and Walt Disney World! Booked a hotel and ready to go? Check out everything you need to know about flying to Disneyland. Thanks for the hotel tips. We always go for a nicer hotel on vacation. Having a bad hotel experience can make a vacation not as fun.